After seeing Crown’s QuickPick® Remote order picking technology at an exhibition, Project Manager Martijn Vogelzang called in Crown who set up a series of trials of its GPC 3000 order pickers with QuickPick® Remote. These were a great success, with an initial productivity gain of 5-7 per cent which has since increased to 7.5 per cent. More importantly, staff reported less fatigue because they were doing less walking between the racks, the picking cages and the operator platform of the truck. In a typical shift using a standard order picker, an operator can expect to step on and off the truck around 1,200 times. QuickPick® Remote dramatically reduces this – by up to 70 per cent – because the operator can position the truck for optimal picking without the need to keep getting on and off. 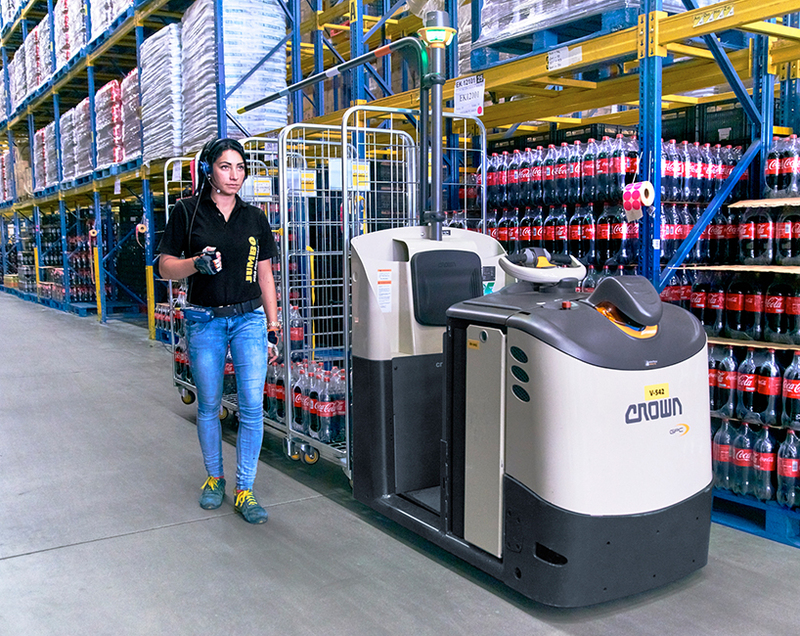 > Feedback on the Crown GPC 3000 order picker has been overwhelmingly positive with operators finding it easy to drive and position in the aisle. Furthermore, around 90 per cent of operators say that QuickPick® Remote is easy to learn and operate and they are less fatigued at the end of a shift. > During the trials, the GPC order picker was the operators’ first choice, even without QuickPick® Remote being fitted. Particularly well-received were the light and responsive electronic steering, the award-winning X10® handle that allows simultaneous operation of all functions with one hand, and the low step into the driving compartment. > Each Crown GPC 3000 order picker can carry four roll cages, and a colour-coded system allows operators to pick for multiple locations at a time, contributing to the overall productivity improvement of 7.5 per cent while reducing physical stress and strain for the operators.